"When Optimus Prime dealt a crushing blow to Megatron in the Battle of Chicago, the triumph was short-lived. If there was ever any doubt, the Autobots now know for certain: as long as there is a Decepticon with a spark in his circuits, their centuries-old war will continue." That tells me nothing about the Transformer in the box, besides the fact that he's a Decepticon. I'd like to think the little Decepticon logo on Galavatron's chest and next to his name on the back of the box tells me that fact. Let me give you a real run down of Galvatron. Galvatron is Megatron's new body. I've got to give top marks to Megatron for survival; he seems to have more lives than a cat does at a dog pound. He's been frozen on ice for thousands of years, he survived. He got taken offline by the All Spark, the creator of all new Transformers. He got repaired, and he was back in action. He kept himself together to make it into the Dark of the Moon, where he got an axe put though his head. He then tricked those dumb humans to make him a new body, and while his spark remained in his old head, he got himself a new body to walk around in. This guy is one tough cookie to kill. I am calling it a safe bet, even if his old head is ever crushed, Galvatron will go on. 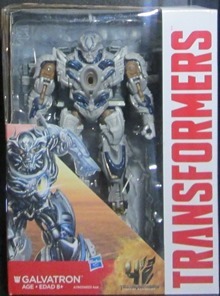 Galvatron comes out of the box already in robot mode, which is common for this series and size class. I think his biggest flaw in robot mode is his lack of articulation. I might as well start with my number one beef with him. While Galvatron does have some articulation, it's compromised by his design. 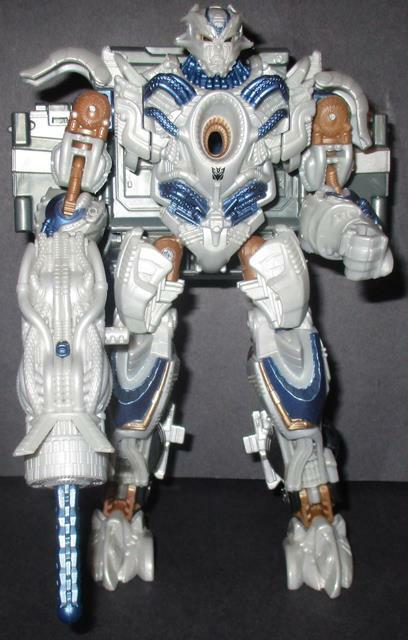 I mean there isn't a single ball joint to be found on Galvatron. Which, to old school Transformer fans, might seem like a great thing since it means the designers had to think how to make him transform. It also means that he's working from a disadvantage. Look at it like this -- Galvatron raises his gun to eye level, and turns his head to fire... and then the flaws pop up. The shoulder guard isn't firmly attached to the upper arm, creating a gap. With his head turned over a shoulder like you or I would do, you make a new visible gap in Galvatron's chest, and not one for lack of a spark. It is physically impossible for this figure of Galvatron to raise his hands for victory due to those shoulder guards I mentioned. You think that is bad? His knees are worse. The leg is 4 and 1/6 inches long, the knee joint is 3 and 1/4 of an inch from the foot up, and only can bend 70 degrees. Good thing Galvatron is not known for having a femme fatal, because with knees like that he's not popping the question to anybody. Everyone wants to know how does Galvatron the action figure measure up to Galvatron the movie star. Part of me wants to say he looks great, and part of me wants to ask why did they drop the ball when they had in hand and ready for a touchdown. I look at the chest and face and I scream it looks dead on. Heck, Galvatron has a hole in the middle of his chest, just like in the movie. Even the arms look almost there, with the spikes on the back of Galavatron's hands -- which with a little extension could give him a look similar to Wolverine and his infamous claws. Then the other shoe drops. He needs either a paint job, or electronics to really look like what he did in the movie. In the movie, his blue highlights tend to shift from dark to light, and his paint job just doesn't do that. Yes he has a load of cables (at least implied in the mold), and there aren't many dead spaces where he's hollow. Still, is it too much to ask for a decent paint job? Or say how about letting the light in the back of head so his eyes can light up like they do in the movie? Galvatron's weapon does look like what it did in the movie. However it only fires a single shot, guess you could say it has limited space so one shot over five. You can plug it into his hand via one of two plugs on it. One is visible; one his hidden under a mesh of cables to make it appear like it did the movie. The missile has a range of about 18 inches. Let's transform Galvatron boys and girls. Flip the cab top down towards his feet, then push the grill part out all the way to its bottom. It has a nice little flap of plastic to drop it around less than an inch. This will give you the space to flip the head in. Then curl up the arms, and flip them back there towards his head. Flip the cab forwards so it covers Galavatron's head. Flip the feet up towards the legs, flip out the pieces of plastic covering the wheels, and the transformation is complete. While Optimus Prime is famous for transforming into a truck, this is Galvatron's (or Megatron's) first time in this form. He has a very slick, very modern look for a truck. He has six wheels that actually roll. Could've used some paint work here to give them some detailing other than molded plastic. Hasbro could've done a little more work on its back part so Galvatron could actually pull a trailer, ohh imagine that. Let's move forward shall we? 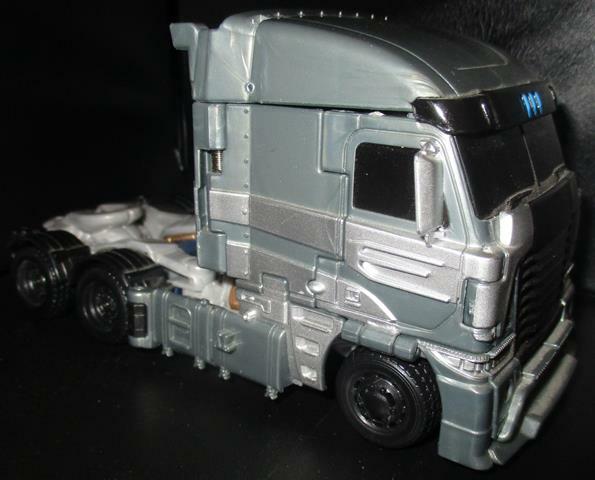 You can actually see inside the cab where you crammed his arms and head when you transformed him. Nice detail work on the rear of the truck, right up until the smoke stacks. Mine are two different styles (manufacturing mistake? ), and adding a little chrome here wouldn't have hurt. On top of the cab is a 5 mm hole which normally holds his weapon. The doors and front part feel bland color-wise. I mean the detail work is great, and is movie accurate, but sometimes you wish they'd use even a bit of gloss here and there. From a playing perspective he's great in this mode. In the interests of science (and as a reviewer who watches too much Mythbusters), I did a live fire test of his missile launcher. It's nothing spectacular, but when mounted on the cab it gives you a range of about 9 inches. Far enough to hit another Transformer, but it won't damage anything. He does roll smoothly on all surfaces. There is a gimmick with the wheels where when you rolls him, it generates a nice rumbling sound to help you imagine he's an actual truck. It's not something I can recall hearing in many Transformers. Transformation Design: 7/10 I know the pros and cons of ball joints, so I didn't hold it against him. I also feel this design has a lot of potential for future toys with some tweaking. I just hate the fact the cab hangs behind him like some cape that couldn't be oriented in the correct fashion. Then again there are only two Transformers known for having capes, Starscream and Alpha Trion. Durability: 10/10 One thing that is known for making toys weaker is the 'hollow bot syndrome'. Galvatron has this at a minimum. The lack of ball joints also means lots of pins, so he'll stay in one piece more likely. Yes I put him though the usual battery of toy tests, and he took it like champ. Even his few small parts aren't likely to break off because they aren't that small. Fun: 8/10 Alright if you are someone who loves when your toys can assume any position you can dream up, you'll hate him. However I can see a load of kids having fun with him as he is. That being said, despite lacking ball joints, he really does move well which helps with the fun factor. As a truck he's on the same level as Optimus Prime which usually ranks 10 for 10. Aesthetics: 7/10 I know a load of Transformer fans hate the Bayverse bots because of the difficulty of transforming them, which in turn is caused by how they look in the movies. I bring this point up since it would be impossible to replicate that ability with a toy given how Galvatron transforms in the movie. That being said, while he does look good, he also looks bland. Not dusty bland, but he does needs a better paint job to help the colors pop. He looks dull. Articulation: 5/10 As I've noted, he lacks ball joints: strike #1. His knee placement is weird: strike #2. He really can't raise his arms up: strike #3 at the plate! While Galvatron has decent moves, and I'll even say exceptional ones for one without ball joints, well the strikes add up here to a mid-range score, sports fans. Value 7/10: I paid $30 or so when I bought Galvatron, and a check of eBay (January 2017) shows him in the $40-$60 price point range. Is he worth it? Part me wants to say no, but because of his durability and articulation that I noted above am I giving him a 7 out of 10. This isn't a toy that is going to fall apart with a little rough play. Heck odds are if he was say left in a sand box, over the winter he'd still be great to play with. Overall: 6/10 Talk about your narrow pass es, eh Galvatron? Yes Galvatron has he weak points when it comes to his paint job, his articulation, and how he transforms when compared to the movie. The upsides, I feel, do outweigh the bad. He's durable, so you aren't spending a large sum on a toy that falls apart the first time you sneeze. He has enough movement so he's fun to play with; he's got that weird rumble feature when he rolls as a truck, kudos to Hasbro for that innovation. With that this is Hotshot81 signing off.